On December 10, 1982, in Montego Bay, Jamaica, United Nations Convention on the Law of the Sea (UNCLOS) was presented for signature. Over 115 countries signed that same day. UNCLOS came into force on November 16, 1994, and has been broadly accepted by the international community.To date, 161 States and the European Union have joined the convention. In some ways, the law of the sea has always had a tension between states supporting the doctrine of an open sea (mare liberum) and states that seek control over a more closed sea (mare clausum). This struggle has been continuous throughout the evolution of the law of the sea and many UNCLOS provisions reflect this balance between coastal state and maritime state interests. 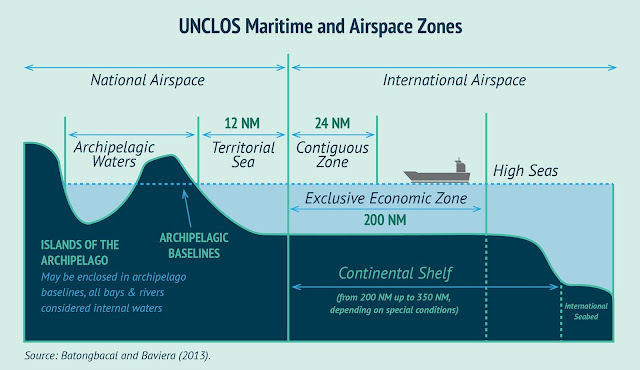 UNCLOS provides for different maritime zones with varying substantive regimes. For instance, the coastal state has sovereignty over the territorial sea, which extends up to 12 nm from the baseline. Foreign warships must follow the conditions of Article 19 for ‘innocent passage’ if they are to navigate through the territorial seas of a coastal state. Article 25 permits the coastal state to protect itself and ‘take the necessary steps in its territorial sea to prevent passage which is not innocent.’ On the other hand, all states equally enjoy the freedom of navigation and overflight in the high seas, an area beyond national jurisdiction. Situated between these two substantive regimes is the EEZ, which is arguably the most complicated of the maritime zones in terms of regulation and enforcement. The concept of an EEZ developed early in the course of negotiations during the third United Nations Conference on the Law of the Sea (UNCLOS III). Asian and African states adopted the 1972 Addis Ababa Declaration recognizing the right of a coastal state to establish an EEZ up to 200 nm in which ‘the coastal state would exercise permanent sovereignty over all resources without unduly hampering other legitimate uses of the sea, including freedom of navigation, of overflight and laying cables and pipelines.’ During UNCLOS III, there was considerable debate regarding the EEZ’s legal status. Maritime powers maintained that the EEZ should have the traditional freedoms of the high seas, while coastal states argued for more rights and control over the zone. The result is an EEZ that is a compromise between the varying positions. UNCLOS Article 56 establishes the substantive regime of the EEZ. This maritime zone begins where the territorial sea ends and is to extend no more than 200 nm from the baseline. The coastal state has the sovereign rights for the economic exploitation and exploration of all resources in the EEZ, including, for instance, energy production. The coastal state also has jurisdiction over artificial islands and installations, marine scientific research, and the protection and preservation of the marine environment. In its regulation of the EEZ, the coastal state is obliged to give ‘due regard’ to the rights and duties of other states and must act in a ‘manner compatible’ with the Convention. It is important to note that ‘sovereign rights’does not mean sovereignty. Other states enjoy freedoms in the EEZ similar to those of the high seas, such as navigation and overflight. Article 58 outlines the rights and duties of other states in the EEZ and mandates a similar obligation upon maritime states to have ‘due regard’ to the rights and duties of the coastal state. Thus, articles 56 and 58 strike a balance between the interests of the coastal states, and the right to the freedom of navigation of all other states. The cross-reference to Articles 88 to 115 in Article 58 applies certain high seas provisions to the EEZ, so long as they are compatible with this regime. Therefore, Article 58(2) envisions that other states may need to engage in certain non-economic, high-seas activities in the EEZ, such as hot pursuit, counter-piracy efforts, assistance and rescue missions, and the suppression of drug trafficking. Since the conclusion of UNCLOS in 1982, the general concept of an EEZ and the right for a coastal state to exercise sovereign rights over economic activity and resources have become customary international law. However, as a relatively new concept in international law, the specific scope of rights and responsibilities in the EEZ is dynamic and ever-evolving. UNCLOS does not clarify the specific issue of military activities in the EEZ and a major source of contention continues to be whether maritime states may unilaterally conduct certain military operations in the EEZ of the coastal state without permission. Some maritime powers support unfettered military activity in the EEZ by emphasizing the freedom of navigation. Conversely, some coastal states object to military activity in their EEZ by expressing concern for their national security and their resource sovereignty. This divergence in perspective regarding the legality of foreign military activities in the EEZ is partly due to varying interpretations of Article 58, which permits maritime states to engage in ‘other internationally lawful uses of the sea related to these freedoms, such as those associated with the operation of ships, aircraft and submarine cables and pipelines, and compatible with the other provisions of this Convention.’ Thus, nations such as the United States perceive this provision to permit naval operations in the EEZ as an activity ‘associated with the operation of ships’ and more generally, as protected within the scope of the freedom of navigation. The Brazilian Government understands that the provisions of the Convention do not authorize other States to carry out military exercises or manoeuvres, in particular those involving the use of weapons or explosives, in the exclusive economic zone without the consent of the coastal State. The Convention does not authorize the coastal State to prohibit military exercises in its exclusive economic zone. The rights of the coastal State in its exclusive economic zone are listed in article 56 of the Convention, and no such authority is given to the coastal State. In the exclusive economic zone all States enjoy the freedoms of navigation and overflight, subject to the relevant provisions of the Convention. These declarations demonstrate the sharp disagreement and variance in interpretation regarding the legality of conducting military activities in the EEZ of another country. The solution in the Convention text is very complicated. Nowhere is it clearly stated whether a third state may or may not conduct military activities in the exclusive economic zone of a coastal state. But, it was the general understanding that the text we negotiated and agreed upon would permit such activities to be conducted. I therefore would disagree with the statement made in Montego Bay by Brazil, in December 1982, that a third state may not conduct military activities in Brazil’s exclusive economic zone[…]. Although some states have interpreted Article 301 to prohibit foreign military activities in the EEZ, it does not follow that military activities are inherently non-peaceful. While Article 88, for example, reserves the high seas for peaceful purposes, military maneuvers and exercises have traditionally been considered compatible with the freedom of the high seas. In tandem, Articles 56 and 58 mandate that coastal and maritime states shall mutually respect each other’s rights and duties in the EEZ. These articles are meant to balance the interests of various states in the EEZ. However, ‘due regard’ is not defined in the Convention and is open to interpretation. For instance, proponents of the legality of military activities in the EEZ argue that such actions do not interfere with the economic activity of a nation and thus cannot be regulated by the coastal state. What regard is due will inevitably depend on the circumstances, for instance, a military vessel conducting weapons tests may need to take measures to ensure the safety of maritime navigation in the vicinity. In cases where the extent of a state’s legal rights in the EEZ is uncertain, Article 59 provides that the conflict in interests ‘should be resolved on the basis of equity and in the light of all the relevant circumstances, taking into account the respective importance of the interests involved to the parties as well as to the international community as a whole.’ Thus, circumstances matter and the implication is that there are many variables in determining whether certain military activities are permissible in the EEZ of a state, such as the scope and nature of the activity, the proximity of the vessel to the coastal state, and the impact on the marine environment. Jing Geng, Utrecht University School of Law, LL.M. Candidate Public International Law (2012); Washington University School of Law, J.D. (2011); Washington University College of Arts & Sciences, B.A. Psychology (2008). JA Duff, ‘The United States and the Law of the Sea Convention: Sliding Back from Accession and Ratification’ (2005) 11 Ocean and Coastal LJ 1, 6. United Nations Convention on the Law of the Sea – Current Status accessed 30 January 2012. United Nations Convention on the Law of the Sea – Current Status (n 10). United Nations Convention on the Law of the Sea, 10 December 1982, 1833 UNTS 397 Overview and full text accessed 30 January 2012. DG Stephens, ‘The Impact of the 1982 Law of the Sea Convention on the Conduct of Peacetime Naval/Military Operations’ (1998) 29 Cal W Int’l LJ 283. M Lehto, ‘Restrictions on Military Activities in the Baltic Sea – A Basis for a Regional Regime?’ (1991) 2 Finnish YB Int’l L 38, 45; see also art 88 United Nations Convention on the Law of the Sea (UNCLOS) 10 December 1982, 1833 UNTS 397. CE Pirtle, ‘Military Uses of Ocean Space and the Law of the Sea in the New Millennium’ (2000) 31 Ocean Dev and Int’l L 7, 11. Subject to the right of innocent passage and transit passage of foreign vessels. See UNCLOS, Arts 17 and 38 respectively. See eg, DR Rothwell and T Stephens, The International Law of the Sea (Hart Publishing, Portland 2010) 428. S Mahmoudi, ‘Foreign Military Activities in the Swedish Economic Zone’ (1996) 11 Int’l J Marine and Coastal L 365, 366. Commander JC Meyer, USN, ‘The Impact of the Exclusive Economic Zone on Naval Operations’ (1992) 40 Navak L Rev 241. JM Van Dyke, ‘Military ships and planes operating in the exclusive economic zone of another country’ (2004) 28 Marine Policy 29, 36. Galdoresi and Kaufman (n 29) 285. Rothwell and Stephens (n 25) 284. See eg, the United States Navy’s Freedom of Navigation Program as described in WJ Aceves, ‘The Freedom of Navigation Program: A Study of the Relationship Between Law and Politics’ (1995) 19 Hastings Int’l & Comp L Rev 259. M Valencia, ‘Intelligence Gathering, the South China Sea, and the Law of the Sea’ (Nautilius Institute, 30 August 2011) accessed 30 January 2012. See also MJ Valencia and Y Amae, ‘Regime Building in the East China Sea’ (2003) 34 Ocean Dev and Int’l L 189. Y Song, ‘The PRC’s Peacetime Military Activities in Taiwan’s EEZ: A Question of Legality’ (2001) 16 Int’l J Marine and Coastal L 625, 635, ‘Specifically, the U.S. interprets UNCLOS Art 58(1) to permit “military activities such as task force maneuvering, flight operations, military exercises, naval survey, information gathering, and weapons testing and firing.”’ ibid 636. Van Dyke (n 40) 30. UNCLOS, Art 310 for ‘Declarations and statements’, ‘Article 309 does not preclude a State, when signing, ratifying or acceding to this Convention, from making declarations or statements, however phrased or named, with a view, inter alia, to the harmonization of its laws and regulations with the provisions of this Convention, provided that such declarations or statements do not purport to exclude or to modify the legal effect of the provisions of this Convention in their application to that State. See generally United Nations Convention on the Law of the Sea: Declarations and Statements accessed 30 January 2012. UNCLOS Declarations and Statements (n 52). Brazil (1988), UNCLOS Declarations and Statements (n 52). The Netherlands (1996), UNCLOS Declarations and Statements (n 52). Van Dyke (n 40) 29. Van Dyke (n 40) 31. Case concerning Corfu Channel (United Kingdom v Albania)  ICJ Rep 4. UNCLOS (n 16) Art 301. See also Art 2(4) United Nations, Charter of the United Nations (24 October 1945) 1 UNTS XVI. UNCLOS Declaration and Statements (n 52). UNCLOS (n 16) art 88. UNCLOS (n 17) Arts 56 and 58. Rothwell and Stephens (n 25) 280.